You’re a Leadership Rockland graduate. Continue the experience by participating in Leadership Rockland Alumni activities. More than 600 men and women have completed the Leadership Rockland curriculum. We believe they are among Rockland’s best informed and most highly motivated individuals. Take advantage of the special bond created among you and your classmates. Getting involved with your peer group of established and emerging leaders – and continuing the experience – is the best way! If you have information to send in for Alumni newsletters / announcements, please email Alumni Chair Lorette Adams at alumni@leadershiprockland.org. Build on the momentum of Leadership Rockland by maintaining contact with alumni and encouraging involvement in community affairs. Develop leadership through training, mentoring and real life experience. Stimulate intellectual growth and social action by providing opportunities, sharing ideas, having a voice and taking part in projects that make a difference. 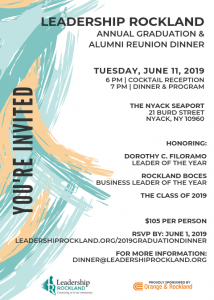 Harness the energy and experience of Leadership Rockland so that alumni may serve as a force for positive change in our community and our world.